Persons of African heritage have lived, worked and worshiped in Newport since the mid-17th Century. Established as a major slave port, Newport would have one of the largest populations of enslaved and free Africans in the American Colonies. By 1780 Newport Africans would establish the Free African Union Society and in 1808 the nation’s first Free African School is established on School Street. During the 19th century there are four vibrant African American churches within the Bellevue Avenue, Historic Hill and West Broadway neighborhoods. Newport is one of the very few early American communities that did not restrict African heritage people on where they could live. While many early communities would confine African heritage people to living in segregated sections of town with racially distinguishable names such as Little Liberia, Little Africa, New Goree and Snow Town, African heritage persons in Newport, like their white counterparts, lived in proximity to either their trade or place of worship. 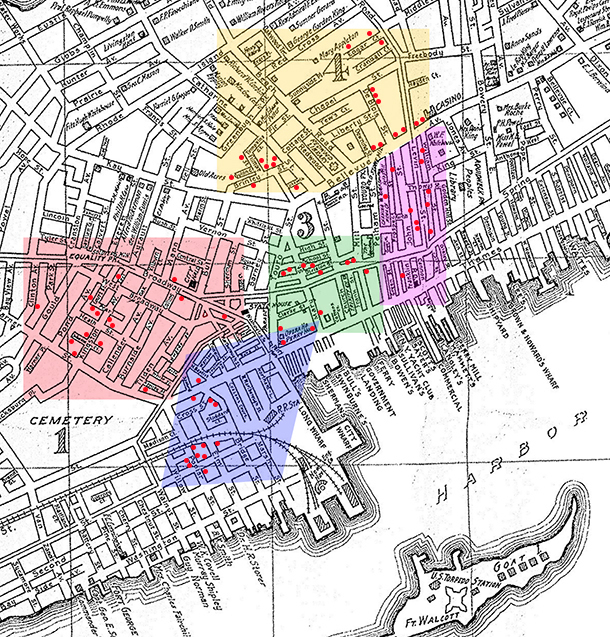 During the Gilded Age, five neighborhoods contained the largest clusters of African Americans who lived, worked and worshiped side by side with white community members. Today, these neighborhoods contain much of Newport’s 18th and 19th century historic structures. Here is but a small representation of the individuals living in the Newport during that era. Click on a neighborhood name or a map area to view close up.